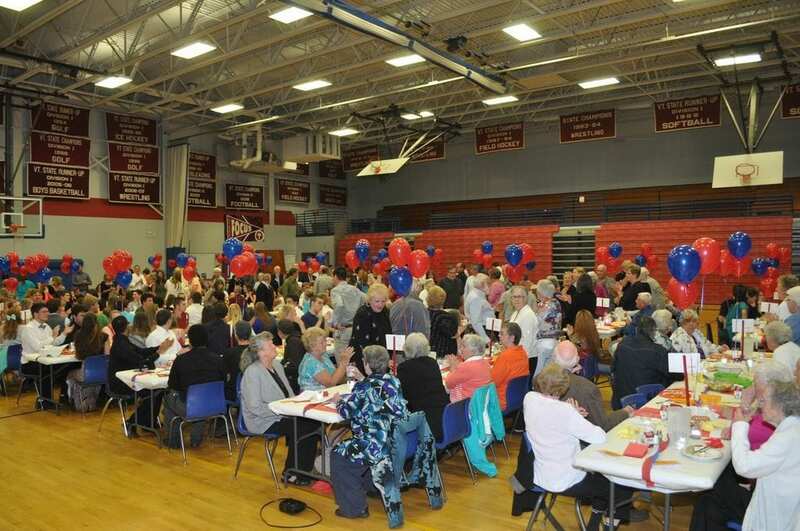 The 118th Annual Meeting and Banquet of the Spaulding High School Alumni Association was held in the school gymnasium on Thursday, June 12th. Approximately 300 alumni, members of the graduating class of 2014, and their family and friends were in attendance. Robert Booth (SHS ‘00) and his SHS jazz band entertained prior to the start of the program. Master of ceremonies for the evening was association president Jamie Paterson (SHS ‘86). J. Guy Isabelle (SHS ‘70) was class marshal, introducing and leading in a number of reunion classes as well as seventy members of the class of 2014. Pianist Mary Finn Casey (SHS ‘57) played the Spaulding march during the procession, as well as music for the school hymn “Lead Kindly Light” and the school song “Glory To Spaulding.” Besides this year’s senior class, the largest groups represented the classes of 1939, 1956, 1964, and 1967. Elizabeth Jones LaPerle, SHS ‘84 and mother of senior Justin LaPerle, provided the invocation. A dinner of stuffed chicken breast was catered by John Reilly (SHS ‘74) and his Hilltop Restaurant staff. Kay Wilson Paterson (SHS ‘59) and her husband Jim Paterson (SHS ‘54) officially welcomed the Class of 2014 into the alumni association. Their grandchildren, members of the Class of 2014, Anna Paterson and John Paterson accepted the invitation on behalf of the senior class. Senior class president Nicole Woodcock introduced the remaining class officers, vice-president Kailey Stevens, secretary Anna Paterson, and treasurer Katie Thygesen. Kailey then introduced the senior class advisors, Beth Magwire McKinstry (SHS ‘83), Jennifer Olson, and Stephen Kelley. A short business meeting was then held. Officers and executive board members elected for the 2014-2015 year include: president Jamie Paterson; vice-president Melanie Monty Moore (SHS ‘80); secretary/treasurer Mike Gilbert (SHS ‘66); executive board member for five years, Tim Couture (SHS ‘78); executive board member for six years, Stacey Wilson Benoit, (SHS ‘89); and executive board members for one year, Linda Noyes Livendale (SHS ‘67), William Noyes (SHS ‘68), Jennifer Milne (SHS ‘77), Cheryl Wilmott Zanleoni (SHS ‘66), Mary Fortier Ronson (SHS ‘88), and Kim Cano. Other board members not up for election include, Judy Pinard Guild (SHS ‘83), Amy Giannoni Parent (SHS ‘82). President Paterson thanked outgoing board members Sonia Caplitcka Soucy (SHS ‘55), Micky Lauzon Thompson (SHS ‘82), and Jay Tosi (SHS ‘90) for their service on the alumni board. In other business, it was voted to continue to offer the following awards yearly: two Junior English awards of $50 each; bowls to the valedictorian and salutatorian; cups to the female and male athlete of the year; the Eva G. Smith Wright Memorial Award of $100; the Carroll H. and Elizabeth S. White Award of $100; and the Sentinel Award, a certificate for the recipient and a plaque with the recipient’s name which remains at the school. President Paterson also provided a short overview of the athletic facility upgrade by the SHS Foundation. The first phase of the project, lights on the main field, should be completed by fall. Those who wish to contribute were asked to contact Foundation chair Eddie Rousse (SHS ‘79). The part of the program most came to see, the presentation of awards was next. Judy Guild and Melanie Moore led the presentations. Approximately fifty seniors were awarded items and money totaling in excess of $20,000.